In volleyball, there are two distinct groups of leagues. They are recreational and competitive. Each type of league has its own rules and requires different types of coaching. If you are planning on becoming a volleyball coach, spend some time studying the leagues in your area. Check with the recreational director for more details and make sure your skills are a good fit for the league where your team will be playing. If you decided to step up as a volleyball coach because your son or daughter wants to be on a volleyball team and other parents or a recreational director has talked you into it, you are most likely going to coach a volleyball team for a recreational volleyball league. The goal of such leagues is to teach kids the fundamentals of the game. Typically, a recreational volleyball league will have rules about playing time for all the players. This makes the life of a coach easier because all kids get an equal chance to play as long as they are showing up on time, participating and obeying the rules. Recreational volleyball leagues for the very beginners, usually kids that are 10 or younger, typically have smaller teams, smaller courts, and lighter balls. Such setups create more opportunities for all the kids on the team to participate in the game actively and practice their skills in passing and setting the ball. The lighter ball allows for more control for younger kids. Often, a recreational league will have rules about the ages and levels of experience of the players. Competitive leagues are for kids who demonstrate a lot of skill and talent. Children in competitive leagues get a chance to compete against each other. 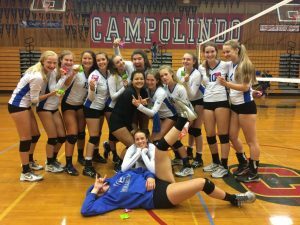 Typically, kids who play in competitive league teams are considering a long-term career in the sport of volleyball. If someone is trying to assign you to coach a competitive team and you don’t feel that you have the necessary skills, notify the director of the league about the situation.